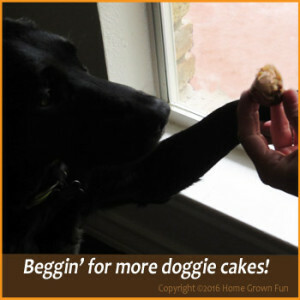 These are the most delicious, homemade dog treats that your dog will ever taste! They are sugar-free, grain-free, and contain no artificial sweeteners whatsoever. Many of the items in these nutritious dog treats are healthy replacements or organic ingredients that provide extra nutrients and necessary fats for your dog. 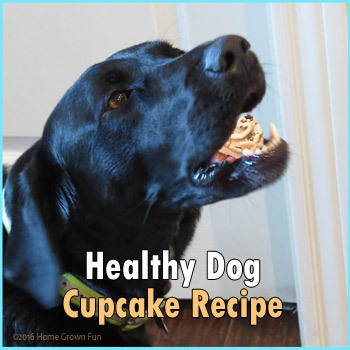 For example, both coconut oil and coconut flour are healthier substitutes for vegetable oils and all-purpose flour which can be problematic to your pooch’s digestive system. Although we use a small amount of chia seed, chia provides calcium, magnesium, iron, fiber, antioxidants, vitamin B, protein, and omega fatty acids which improve the health of your dog’s skin, coat, immune system, brain and eye function, digestion, and growth. Why make your dog cupcakes? We answer that question with another question: WHY NOT? Step 3: Combine mashed banana, egg, peanut butter, and cottage cheese in a large bowl till you have a smooth, uniform mixture. Stir in the baking soda and coconut flour till well mixed. Step 4: Pour batter till each muffin cup is about ¾ of the way full. Step 5: Bake 10-20 minutes or until top turns golden brown. Begin making frosting while cupcakes are in the oven. Step 6: Combine peanut butter, cream cheese, and coconut oil in a small bowl. Cream till smooth with a fork or handheld mixture. Step 7: Place frosting in refrigerator for 10 minutes to harden. Remove cupcakes from pan and cool on wire rack. 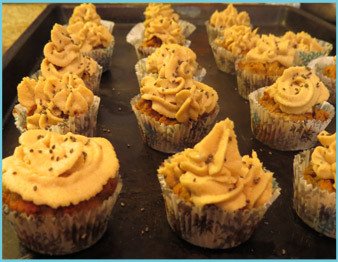 Step 8: After cupcakes are fully cool, frost, sprinkle lightly with chia seed, and serve a maximum of 3 per day. 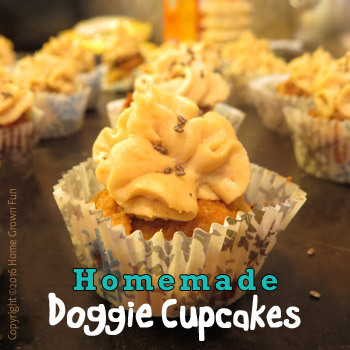 Store the Dog Cupcakes in the Freezer! Keep the cupcakes in the freezer in a sealed box to prevent freezer burn. They will last 2-3 months and will stay soft. No need to defrost before serving to your pooch!